I could go on and on and on……. So how do you choose your box?, or do you just order a job lot from the wholesalers and do them all? I have a problem with that though , as there are not enough days, weeks, months, years! I look at an Earthscape, which is what I called them in one exhibition, but I also think they are equally metaphors for emotions as well, so am I saying that these images are open to interpretation? of course! Of course they are, so back to my dilemma, are they landscapes? conceptual…………oh oh, groundhog day! 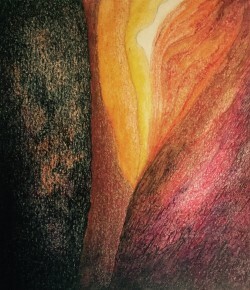 This is a drawing of sunlight pouring through a chasm, but is it hope? or despair, is your glass half full or half empty? 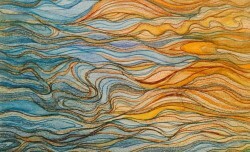 Sketch for new panel, inspired by wave patterns and formations both on land and in the sea. 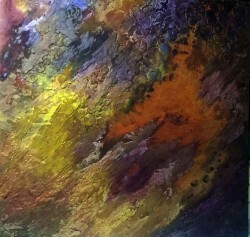 So much of my work encompasses change from one, to another, from light to dark, and because of my technique using relief, gilding and distressing, the work incorporates a changing light and so a time change dimension. I hope to shortly put on website a time lapse video to show exactly this. I have resorted to prep work that can be done in the warmth of the house till I can heat up my studio/shed.